Six classic games designed to stimulate the cerebellum. Is there a better alternative to Big Bang Brain Games? Is Big Bang Brain Games really the best app in Card and Board category? 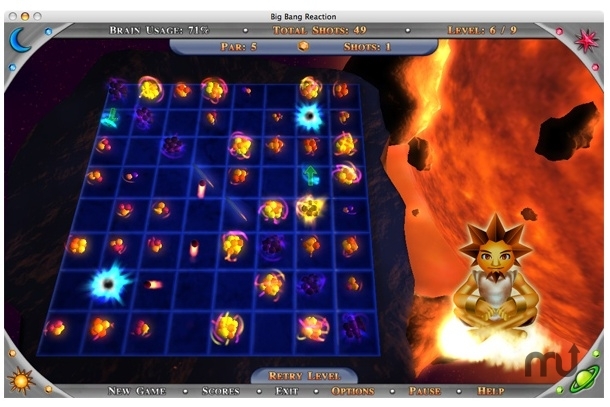 Will Big Bang Brain Games work good on macOS 10.13.4? Big Bang Brain Games... Six classic games designed to stimulate the cerebellum, cajole the cortex, and gratify the grey-matter! Stunning graphics and witty characters make Big Bang Brain Games a truly "Best of Class" experience. The latest research has shown that the use of memory and puzzle games can help create new pathways in the brain, keeping the mind sharp. Whether you're looking to help out the 'ol hippocampus, or just have some fun, there's a game for every age and every taste in the Big Bang Brain Games! Mac OS X 10.3.9 or later, 32MB graphics card (Intel GMA 950 chipsets supported). Big Bang Brain Games needs a review. Be the first to review this app and get the discussion started! Big Bang Brain Games needs a rating. Be the first to rate this app and get the discussion started!